For as much as he accomplished after recovering from a 15-car pileup on the second lap, Kyle Busch didn't want to hear about moral victories after a flat tire from contact with another car ended any shot of winning Saturday's Bass Pro Shops NRA Night Race at Bristol Motor Speedway. "I don't know if there was any highs, I don't know what you're talking about," Busch said in his post-race interview on NBC Sports Network. Pressed for a reaction on Busch's incredible job of battling back from the early crash to get as high as third before the late troubles, the driver of the No. 18 M&M's White Chocolate Toyota did find some positives. All of them revolved around the yeoman's work he did getting back to the front after the early-race pileup. Busch found trouble almost immediately on Saturday after nudging Ryan Blaney. 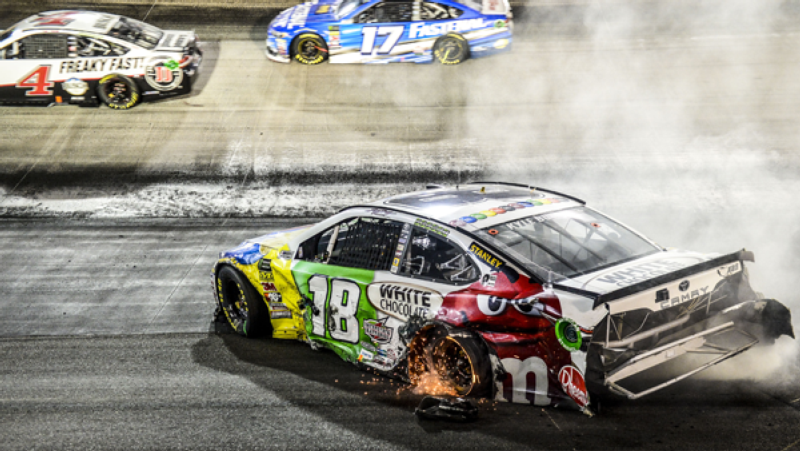 The contact caused Busch to spin, with the car receiving significant damage when Jesse Little and Michael McDowell ran into Busch. Busch pitted multiple times to get the damage repaired, going two laps down in the process, and even raced the rest of the night without a bumper. But he clearly had a fast car, working his way up through the field in impressive fashion. He got up to third, nudging Martin Truex Jr. to end his day, but Busch's race-long charge finally ended with 19 laps remaining. Going three-wide after a late restart, Busch tried to squeeze past No. 11 Denny Hamlin on top, but contact with Hamlin caused a flat tire on the rear driver's side, leading to Busch spinning out. He ended up finishing 20th to end his roller-coaster evening. "It's just me and this team and never giving up, being able to drive up the field like that," Busch said. "This Camry was fast, even torn up and beat up and wrecked, it was fast. We had a shot to win the race there, and got to racing the guys three-wide and couldn't get clear of them. I was boxed in by the 11, the 11 was choking up the top in front of me. If I could ever get clear of them, I could shoot to the bottom and get clear of the 11, but we were just stuck and mired where we were." The defending Night Race winner, Busch, who has seven career Bristol victories, only had one regret on his late charge, wishing he didn't pit on one of the late cautions. "Maybe if we would have stayed out we would have inherited the fourth starting position on the restart and didn't have all that," Busch said. "(But) we should have never even been in that spot with how tore up this racecar was. We probably finished where we should have, but we had a shot anyways."